We, The Heinzs', are a Family of three and owned by our English Cockers located in Forest Hill Maryland. We, The Plotts', are a Family of four and we too are owned by the English Cockers located in Fallston MD (10 miles from Forest Hill MD). We show our dogs but first and foremost they are pets who with us enjoy the show ring. 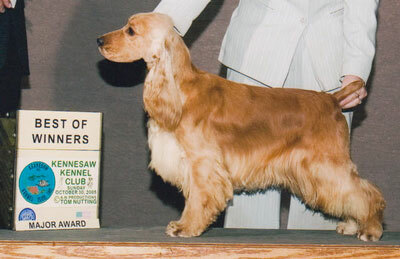 We participate in Conformation shows with the AKC and UKC. Occasionally, we have a litter of puppies when we are seeking to keep one for ourselves as our next Show Prospect. Our families all play an important role in raising our pups with love and endless socialization. We pride ourselves on breeding both quality, but also happy healthy puppies of sound temperament. All puppies are raised in our loving home environment and remain so until leaving to start their new life. Jacksonville Vet Hospital is our clinic where they treat our dogs like theirs. Thank you staff of Jacksonville!